Animal Aloe 4oz is 100% safe - edible and it is a multi purpose product. It is soothing to hotspots, flea bites, irritation and minor skin irruptions, hair loss, skin abrasions, scarring and also brushed on gums for tooth and gum treatment. Safe food quality ingredients is popular to squeeze on food to support; pets digestion, gas, constipation, allergy symptoms, colds, and overall wellness. Animal Aloe 4oz is 100% safe-edible and it is a multi purpose product. It is soothing to hotspots, flea bites, irritation and minor skin irruptions, hair loss, skin abrasions, scarring and also brushed on gums for tooth and gum treatment. Safe food quality ingredients are popular to squeeze on food to support; pets digestion, gas, constipation, allergy symptoms, colds, and overall wellness. For large animals over 10lbs the WL Aloe Vera Juice Concentrate is best and may be poured into water or food 1-3 tbs to bowel tolerance. 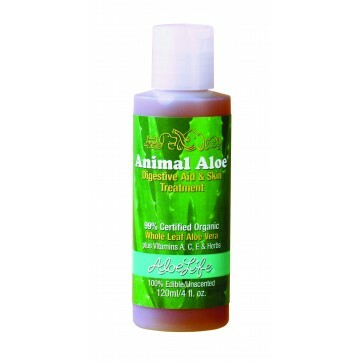 Animal Aloe Application Instructions: Apply a thin layer on affected area 1-3 times a day, 1/2 tsp on food 1-3 times a day.